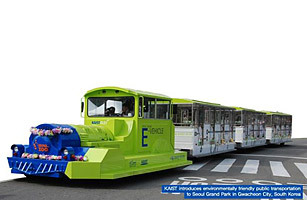 It's no Soul Train, but some Seoul bus rides could soon be getting a lot more electric. Engineers from the Korea Advanced Institute of Technology are experimenting with embedding electric strips in roadbeds that magnetically transfer energy to battery-powered vehicles above. The prototype, at an amusement park in Gwacheon, just south of Seoul, is the first system in the world like it, and researchers say the technology could someday enable all electric vehicles to operate with one-fifth the battery size and at one-third the cost.